Uncle Ted was a master fisherman. How do I know that? Uncle Ted said so! 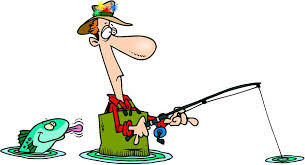 After retirement, he fished every day except Sundays. Ted always brought home a bunch of fish. And why not? He was a master fisherman. In his eyes that meant that he knew which was the best rod and reel, best lure, best live bait, and, of course, he knew the best fishing holes (which he kept secret) AND the perfect time of day to fish. No matter that Ted was a master fisherman, there was always “One that Got Away.” As good a fisherman as Ted was, caught and brought home quite a few whoppers most days, and at least once a week there came with that batch of fish a story about the “One that Got Away.” It was the biggest, strongest, most evasive and most beautiful fish he’d ever seen. How big was it? Well, that depended on which week and to whom he told the story. It seemed to everyone in the family that years ago when Ted told us about that fish that got away, it’s MUCH larger today than it was then. Every family has an “Uncle Ted.” Most of the time we smile at the stories, knowing that next week’s one that got away was going to be even bigger. We shrug off Ted and his stories and go about our business. That’s just the way one handles stories like that. A crab trap is a box-shaped wire contraption that has a round hole in the top. When it’s time to catch crabs, you put bait inside the trap on the bottom, drop the trap into the water where crabs live, and just wait. After enough time has passed for crabs to discover that feast in that trap and crawl through that hole to munch on that chicken neck you left, you pull the trap out of the water. And if you’re lucky, you’ll find several crabs have taken the bait and are in the trap. If you step back and watch those crabs for a while, you’ll usually see one that figures out there’s a way to escape their bleak future by getting out of the trap. That crab will crawl up the side of the trap across the wire top to get to that hole he crawled through to begin his trek. But seldom does he make it out of the trap. Why? Inevitably, one or several of the crabs sharing the trap reaches up with a claw, latch onto the escaping crab, and pull him back to the floor of the trap with them. More often than not, that crab never makes an escape. As of yesterday, heads of Democrat-controlled committees in the House of Representatives had notified 81 people via letter and/or subpoena their committees’ demands for either production of specific documents or appearances before committees to give sworn testimony or both. (a) Robert S. Mueller III is appointed t() serve as Specia] Counsel for the United States Department of Justice. For two years with the unfettered resources and permissions of every department of the Federal Government and with an unlimited budget, Robert Mueller has exhaustively investigated Donald Trump and the Trump Campaign for alleged collusion with the Russian government to affect the 2016 presidential election in his favor. $25 million or so dollars and two years later, NO COLLUSION. All “leaked” notices from the Mueller camp indicate his wrap-up report of the investigation is imminent and is alleged to contain no damning evidence of collusion and no evidence implicating the President. In light of the constant badgering by Democrats and even some Republicans threatening President Trump for any interference he might make to fire Mueller, cut funding for the investigation or in any way use his power and authority to impact or stop it, President Trump has made NO efforts to do so. Numerous times in fact he has publicly stated he had NO intentions to intervene in any way. He clearly stated again and again he simply wanted it completed. In light of all this, why then are those House Committees going after the President, current and past members of his administration, and even his family members? At TruthNewsNetwork, on numerous occasions we have clearly made the case predicting that when the Mueller probe is completed, IF there is no referral from Mueller that includes evidence sufficient to warrant impeachment proceedings by the House, Democrats will perpetuate investigations in the all things Trump. Their purpose: do anything and everything necessary to 1) impeach Trump and remove him from office; or 2) blanket him and all those working with him in his presidency with subpoenas, hearings, forced testimony, all the while using their weaponized Media partners to perpetuate claims against Mr. Trump that will push him over the edge so as to pressure him to walk away — resign. Lots of allegations of crimes. Yet Nadler made it clear there is NO evidence of those alleged crimes. Mueller hasn’t found any. Wasn’t Congressman Nadler one of the loudest Democrats with demands directed at the President to stay clear of interference with Robert Mueller and his investigation? Didn’t he as did so many other Democrats claim numerous times that the President “clearly” obstructed justice and there is “evidence” proving collusion with Russians in the 2016 election? Nadler along with House Democrats “other” hitman Adam Schiff have made it clear that they know factually President Trump committed criminally impeachable offenses. My question is this: both Nadler and Schiff served on this same committee in the previous House of Representatives when Dems were in the minority. They participated in their committee’s significant investigation into these charges against the President. Schiff and Nadler both have all through the first two years of this Administration claimed to have such evidence of Trump wrongdoing. So why did they not turn that evidence over to Robert Mueller? Better yet, why did they not turn that evidence over to the leadership of their own committee? What Are Democrats Up To? Politics and nothing more. Democrats were shocked when Trump beat Hillary in 2016. One can only imagine the plans they had for the continuation of their march to Socialism that began under Obama. They were all given a taste during Obama’s eight years of just what having almost unilateral power over everything and everybody in the federal government could do. And they liked it. They could not wait until they could install “The Clinton Presidency, Part II” at 1600 Pennsylvania Avenue. Trump definitely rained on their parade. NONE of their plans carefully crafted for governing in the next eight years could be achieved. They didn’t even have House or Senate control! They had to get it back. And their desperation’s first method was to launch a faux investigation into Trump claiming the Russian collusion. When it became obvious that in spite of the Clinton Campaign’s underwriting that dossier to entice the FBI to go after Mr. Trump, no dirt showed up even if there was any. Their other political ploy was instigated with their midterm election victory to take control of the House. That opened Pandora’s box of investigations: of EVERYTHING Donald Trump. This second option is the scariest one. Many reading this today are too young to remember Senator Joe McCarthy’s legislative witch-hunt looking for Communists. Dozens of those from Hollywood, New York, and Washington who were “outed” as Communists or Communist sympathizers were ruined professionally and privately by McCarthy’s strongarm tactics. Just like today’s Trump investigations, truth and evidence were NOT necessary elements of McCarthy’s work. Allegations and innuendo were all that were needed at the time. There is NO question in my mind that Schiff, Nadler and Company have examined how McCarthy did it and are using his methods (at least in part) to cut short Trump’s tenure in the White House. So what does the story of Uncle Ted and the Crabtrap have to do with today’s narrative above? Simple: Democrats in Trump’s first two years went after him. They at first tried to be subtle. But with each failure by Mueller to uncover Trump wrongdoing, Dems grew angrier and more and more desperate. To make matters worse for Democrats, Trump’s policies implemented in 2017 and 2018 began to work, and work dramatically. The economy took off in every sector. Unemployment numbers over and over again set historical records. Federal tax receipts zoomed to never before seen numbers — even with across the board tax cuts. Then when it became obvious to most that the Mueller probe was about finished with no findings of criminality, their heads exploded. They HAD to do something. So they now have literally taken the law into their own hands. Uncle Ted represents Democrats. And the fish that go away is President Trump. Just like Uncle Ted, Democrats are very upset that their fish apparently escaped when everyone thought Robert Mueller had caught him. Think about it: how are legal investigations structured and implemented? First, when a crime is committed, law enforcement officials launch, implement, and complete an all-out investigation to pull together evidence that reveals every detail of that crime: the perpetrator, motive, and any involvement by others. Beginning with the Mueller probe, this investigatory process in place for two centuries was turned upside down! What crime had been committed sufficient to initiate an investigation? What evidence was there? The instigation of the Mueller probe (and subsequently this “new” probe) was the anger and hatred Democrats have for Donald Trump. THERE APPARENTLY WAS NO CRIME. This probe should have NEVER been initiated. Sources of the vitriol from Democrats for Mr. Trump are two in number. Obviously, his resounding defeat of Hillary set the fire. But to make matters worse, all of the Trump Administration’s accomplishments have poured gasoline on that fire again and again. The “crabology” story explains how Democrats have responded. Instead of paying attention to Trump’s reasoning and methodology that together resulted in the tremendous victories for the U.S., they chose to instead of joining the President in crawling out of the trap of high unemployment, massive government deficit spending, shrinking military protection, loss of international credibility, and almost unexplainable gross domestic product soaring growth, Democrats paid no attention to those successes. All they saw was Trump was taking Americans out of the trap with him. They couldn’t let that happen! So they’re doing everything within their power to pull him back to the bottom where THEY are. Sadly, American citizens — if they are successful — will be pulled right down with him, back on their level. That’s a sad story on many levels. But the most saddening part is that Democrats should be reveling in the amazing progress made under this president in just two years. What will the results of this all be? Who knows. But at least there are enough knowledgeable and impartial people to keep the truth in the minds of Americans. There are very few of those people in today’s media. But thankfully Americans on the most part are wading through the mud to find the truth in all this. “Truth will out.” And it is happening. Stay tuned! The “Trump Saga” is just getting started. It still has close to six years to go — I hope! ← Civil War: About Race or Something Else?